It was a little thing, but what really impressed me was the donuts. 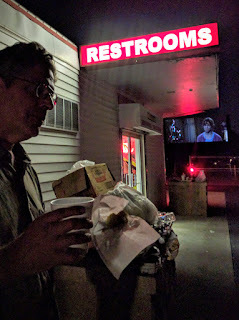 The guy selling the tickets said that after the third movie there’d be donuts and coffee. Yes, that’s right, after the third movie! They showed four movies on our screen for the price of one. We thought we were arriving at the theater a little late, but they were running even later. The two films that sounded best to me were Pete’s Dragon and Don’t Breathe, both with good scores on Rotten Tomatoes; but Mindy would rather opt out of horror films, so Pete it was. According to the posted schedule, we were late. Pete, the second feature on screen three, was scheduled to start at 10:00 pm, but the man at the ticket booth told us the first show had started late. So the schedule on our screen, “the family screen” for the night, was Nine Lives, Pete’s Dragon, The Secret Lives of Pets, and Finding Dory. The three other screens “only” had three films, with the first movie repeated in the fourth slot. As you pay (per person, not per vehicle) at the entrance, you’re given a slip of paper with the radio frequency for each of the four screens. And if you position your car well, you can see all four. 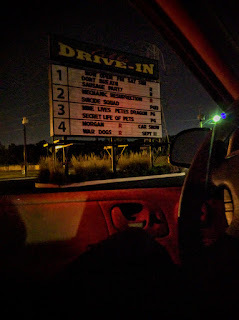 So if you want to look at it a certain way, one gets thirteen films for the price of one at the Tibbs Drive-in. Of course, if you’re a parent and don’t want your five-year-old to see Jason Stratham shooting people up in Mechanic: Resurrection, that might be a problem. 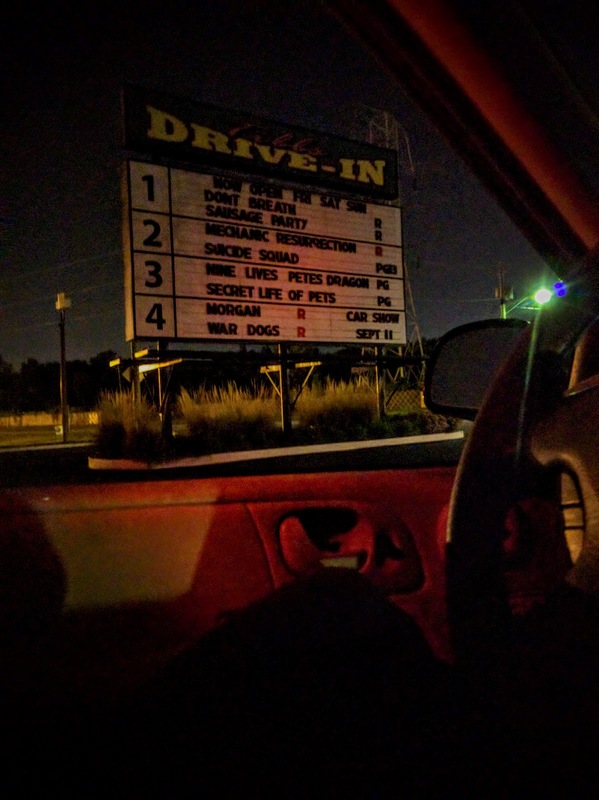 But when I was a kid, seeing all the movies was one of the reasons I considered drive-ins awesome. But as I said, the really impressive thing was the donuts. During the third film, there was an announcement over the radio that the snack bar was closing. As the third film ended, there was another announcement that donuts were available in the snack bar. Now, the donuts were day olds from Dunkin’ Donuts, but still…. free donuts! And they didn’t just have coffee available to keep people awake through the final feature, they had free milk to put kids to sleep during the fourth feature. Sadly, the actual movies we saw were pretty lousy. We saw about the last half hour of Nine Lives, a film in which cranky business man, Kevin Spacey, finds himself trapped in the body of a cat. What we saw of the film made us happy we didn’t see the first hour. Pete’s Dragon is, for unfathomable reasons, set in the 1970’s. We begin the movie seeing a small child riding happily in a car with his mother and father. Since this is a Disney film, we know this is not a good thing. No child (excepting, of course, The Incredibles) can be allowed to have an intact family. So, yes, there is a car accident killing both parents, leaving the child alone in the woods to be cared for by a dragon who seems to have the intelligence of a dog (probably a mutt rather than a pure breed). Again, since it is Disney, and Robert Redford is in the film, the people cutting down trees in the woods are evil because every tree is precious. But in the end, (spoiler!) the kid saves the dragon and the dragon saves the kid. The Secret Lives of Pets had a few clever moments, most of which we’ve seen in trailers for months. When our son-in-law saw the film, he noticed a boy in a wheelchair in the theater as well. There is a particularly tasteless moment in the film when a character questions whether a handicapped dog’s life is worth living. I didn’t like the film, but overall, it was better than I thought it would be. Pete’s Dragon, on the other hand, was much worse than I thought it would be. We didn’t stay for Finding Dory, which is a genuinely good film. We’d had our donuts, it was 2:30 in the morning, and apparently we aren’t as young as we once were. But I was glad to see there are places like the Tibbs still keeping quite busy on a Labor Day weekend. Using Acethinker Video Keeper, you will be able to download movies from your favorite movie sharing sites.